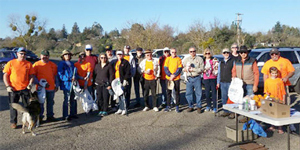 When: Saturday, January 27, 8:30 a.m.
CFFU volunteers will perform our next clean-up event along mile 16 (south side) of the American River bikeway. 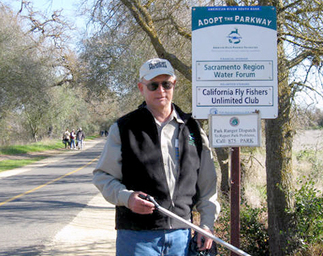 Our club has signed onto the American River Parkway Foundation’s “Adopt the Parkway” program. Under our agreement with the Foundation, CFFU will walk along the bikeway on this stretch of the River four times a year and pick up trash. In return, the Foundation has placed our Club’s name on a sign on the River’s bikeway. Meeting Location: We will meet at the parking lot adjacent to the River and at the end of Rossmoor Drive, which runs north from Coloma Road in Rancho Cordova and just up river from Hagen Community Park. I will have free parking permits for all volunteers. There is no ticket taker or entrance gate. We will gather at 8:30 a.m. at the parking lot for a short orientation and then walk mile 16 on the south side only of the River (downriver and towards Sacramento). I will provide doughnuts and coffee. I will have trash bags and other items necessary for the litter patrol. However, you may want to bring a pick-up gadget. The trek should take about 90 minutes. Like last time, I am hoping for a good turn-out so that we can say we are earning the name recognition our Club is getting from the sign that all bikeway travelers will see. If you cannot spend the time or cannot walk the entire mile, please feel free to walk whatever distance is convenient. Be sure to wear clothing appropriate for the weather and bring water and a pick-up gadget. ​This social and exercise outing is an easy two and a half- mile walk that can earn you credit towards your Presidential Pin and our new CFFU volunteer T-shirt. Finally, if anyone would like to volunteer to stay in the parking lot and watch the cars while we do our clean-up, please let me know. If there are no volunteers, I will stand guard. CFFU participates in the American River Parkway Foundation’s “Adopt the Parkway” program along mile 16 on the south side. We walk along the bikeway on this stretch of the River four times a year and pick up trash. From U.S. Highway 50, take the Sunrise Blvd. off-ramp, heading north. Turn left onto Coloma Road. Turn right on either El Manto or Rossmoor Drive to access the park. One of the community service activities CFFU sponsors is the annual Fish Derby held for the mentally and physically challenged people from Sacramento County. We participate in the International Sportsman's Exposition event at Cal Expo each January to promote fly fishing, recruit new members, and raise funds for our youth programs.